About forty years ago I went with Michael Duffin and his mother Catherine to have our hair cut by Mandy over in Woodlands Avenue. We got the hair cut first and then we went off for a stroll while Catherine received the full attention. Wandering along the avenue we followed a path down towards the river when we came across an old crumbling building, I had two memories of it, first its ramshackled nature and second that I stood into cow slurry, that stunk to high heaven when we got back to Mandys and meant that Catherine had to lower the windows on the way home. The house we had stumbled upon was the original seat of power, if you will pardon the pun of the Powers of Ballycanvan, a family directly related to the Powers of Curraghmore and thus direct descendants of the original Le Poer that landed as part of the Norman conquest. The original tower house, similar no doubt to Ballymaclode castle directly across Ballycanvan Stream (which flows past Jack Meades pub) was later built on and added to. The following is a brief historical run of the owners or occupiers at one time or another. In 1537 there is a list of crimes held against one Thomas Power of Ballycanvan including many extortions of travellers, no doubt using to advantage his location. In 1598 a stone chimenypiece was built with an inscription carved to Richard Power, 4th baron le Poer and Katherine Barry. In 1697 a Captain William Harrison was leasing the property and this was continued by his son John Harrison. It came into the Bolton family when Rev Hugh Bolton (1683-1758) acquired the property as Dean of Waterford. He was succeed by Cornelius Bolton the Elder (1714-1774) who took over in 1758 and extended his ownership to the Mill Farm in 1765. 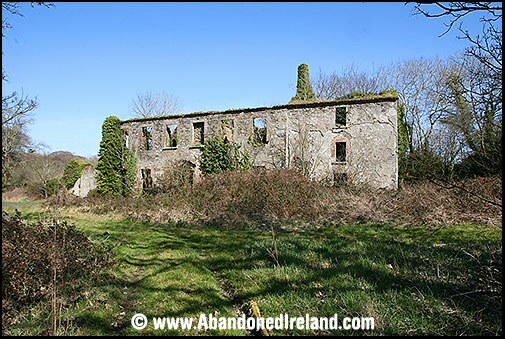 It was here that Arthur Young, the travel writer and chronicler of industrial and agricultural development, visited when he came to East Waterford. We have also met the Mill Farm recently, and the works of Cornelius too. A Georgian mansion was added to the castle at this point. Cornelius Bolton the younger, (1751-1829) sold the house to his younger brother Henry around 1792, no doubt to assist in the ongoing investment at Cheekpoint. Henry however, leased it not long before he died, in 1805, to Samuel Roberts (1758-1834) son of honest John Roberts who did substantial work to the property. On Henry’s death ownership went to his daughter Elizabeth, a fragile lady who had a nervous breakdown in 1807 and never recovered. In 1818 Roberts dropped the lease and Thomas Meagher (1764-1837) took on the property. The Meaghers remained at the property until 1829. Subsequently the property was leased to Richard Morris and family until 1836. The next family found on the property is George Kent (bc1786-1866), who made his money in the bacon trade, and was renting from 1848 to his death. Elizabeth Bolton died in Devon in 1852 and Cornelius Bolton the youngers eldest son Cornelius Henry inherited the property. This he sold in 1857 and it was apparently bought at that time by Patrick Power of Faithlegg House. The Kent family seem to have continued to live on in the house for some time afterwards, but at some point in the subsequent decades structural problems were found in the building and it fell into disrepair. What now remains is a sad reminder of a very busy and illustrious past. One of the enduring memories of elections in our house was my fathers quip “vote early, vote often”. Whether it was a local, national, EU, presidential or referendum, Bob would be wound up with the run in to the day and was positively buzzing when it came to the count. A firm left of centre voter, he took a keen, vocal and biased interest in politics in general. It was the general election of 1977 that I remember most vividly, I guess it must have been the first that I was old enough to understand. Jack Lynch, then leader of Fianna Fail was fighting the election against Liam Cosgrove, then Taoiseach of Fine Geal and to this day I can remember Lynch’s poster plastered on most of the telegraph poles in the village. They say never talk about politics and religion. It was good advice in an Ireland still racked with civil war politics, and even in some homes adults could barely live with each other in the run up and aftermath of elections. My Grandfather – Andy Doherty (hops) had no such qualms however. Aunt Ellen lived with him in the village from where she ran the shop. The shop was a counter inside the door behind which she kept the basics and plenty of sweets and ice cream. The rest of the room was the living room, and Andy was often perched in his seat with the neighbours sitting around; Jim Doherty, Baby Burns, John Barry, Maryanne Cullen to name a few. While Andy poured over the Irish Press and exclaimed loudly on what he found, excoriating everything from the local to the international, Ellen would try to act as moderator and the air was often blue with debate. In fairness, there were strong feelings on all sides whether it was the “civil war politics” still being fought or the campaign waging in Northern Ireland, more often than not I left the shop more confused and unsure of where I should stand, than when I went in. My father told me one time there was pandemonium in the school one election day. 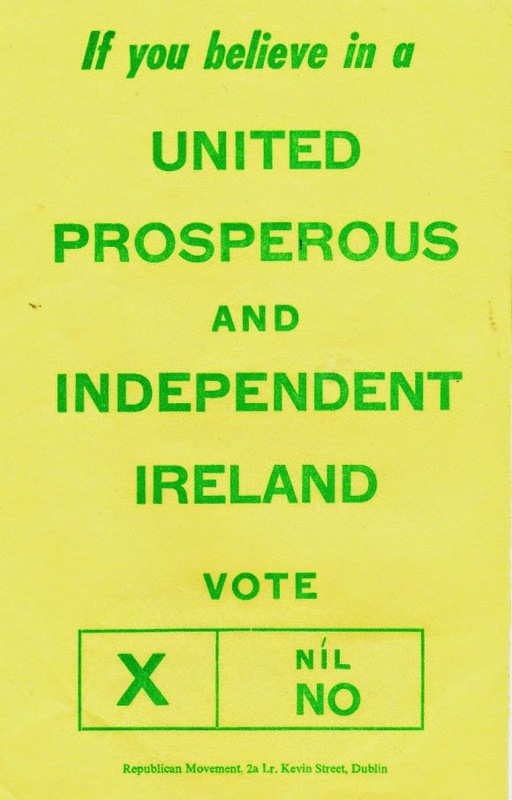 It was the referendum on whether Ireland should join the EEC held in 1972. An older woman from the village had come in and taken her voting slip behind the booth when those present heard her loud exclamation. She arrived back out damning and blasting, asking where in the name of God was de valera’s name? Although the returning officers tried to explain patiently that as de valera was president (and almost 90) he could not feature on the ballot, the woman would not be silenced. A crowd had gathered and there was an excited debate some trying to calm her down, others only adding to the woe. Eventually, a young returning officer (according to my father a teacher in the school at the time) offered a solution, since the woman wanted to vote for de valera and his party was advocating in favour of joining the EEC, surely the woman could be advised that that would be showing allegiance to him. Satisfied, she went back to the booth and exercised her constitutional prerogative. I can’t imagine any personality in Irish politics having the same effect today. Although I can’t say with any certainty that my father voted early, and can almost guarantee that he didn’t “vote often” I can say that he voted every time he was given the option. It was important to him, and my mother and it rubbed off on me. I don’t know which way he would have voted today, but I’m guessing he would have had strong opinions on both, and here’s another Bob telling it plainly and in a way my father would have appreciated. His last ship was the HMS Thetis, a 46 gun 5th rate Frigate. 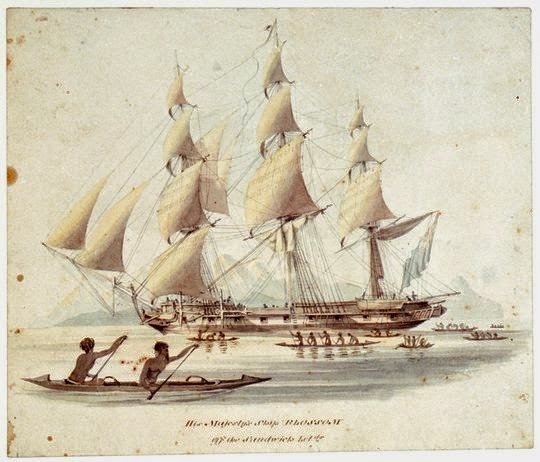 He joined the ship in 1827 in a senior position and served aboard her until August 1930 at which point he got an appointment ashore at Waterford. He was fortunate. 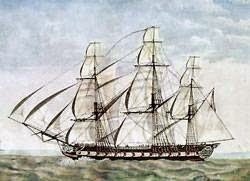 4 months later on the 4th of December the Thetis was wrecked at Cape Frio on the South American Coast. 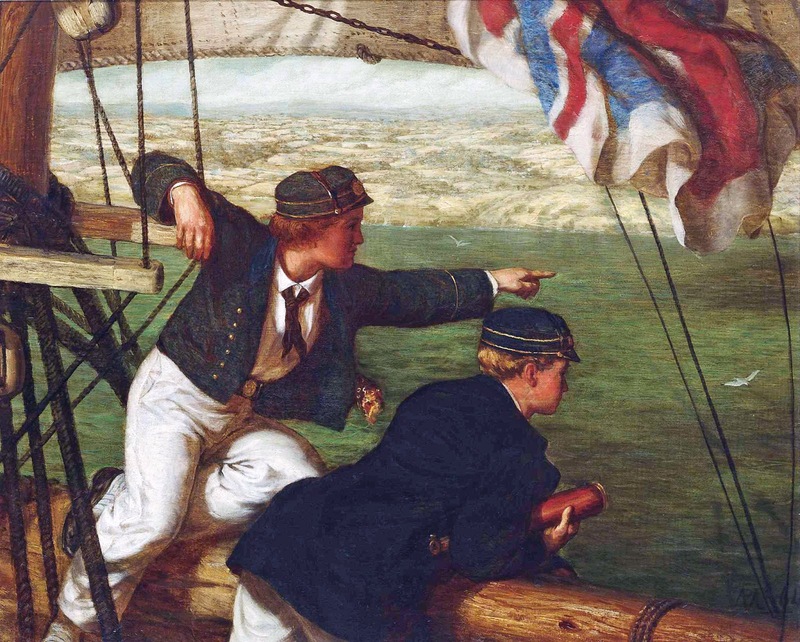 The wreck was a major embarrassment to the Navy and both the captain and master faced a naval tribunal due to miscalculating the ships position. The ship was only a day out of Rio when she drifted ashore. She was later lost with 25 souls, (although 275 men and boys survived) but it was the cargo that was the biggest talking point. She was carrying gold bullion and coinage estimated at the then value of $810,000, collected from taxes and trade. Paddy Moran was an old school fisherman. He was a brother to my Grandmother, Maura Moran, and I knew from her, just how hard she, Paddy and her other brothers worked the river from their earliest years. With the arrival of better nets, outboard motors and relatively comfortable oilskins, life improved. But the old guys still yearned for the old methods, particularly when drifting nets for salmon. Those methods worked for them and they were very slow to change. I’d been raised with the newer methods of salmon fishing, where although the oars were used, it was usually at a minimum, where you probably went home if you were dog tired, where everyone was your friend. So I came as a culture shock to find myself aboard the Judy, his fine old punt of battleship grey and back tar, relearning my trade with “Uncle Paddy”. I’d started earlier in the Spring with Paddy’s son, Pat, and Gerry Boland, fishing eels. But in the summer the eels disappeared and Paddy had a berth for me. Life aboard the Judy was different from the outset. Slow and patient, always watching, never saying much and perpetually on the oars either setting, hauling or keeping up with the nets. He set the nets in a totally different way, hauled him with his own preference and kept me in line with curt commands, or a withering look, that told me who was exactly in charge. As the weeks passed I came to realise just how much I had to re-learn. I struggled to keep the boat on the nets, seemed to run the punt aground when it should have been afloat, set the nets to fast or too slow, couldn’t clear fouls fast enough and couldn’t be trusted with taking in a fish. In other boats I’d fished in the skipper would boast about his catch, Paddy kept it quiet. Most boats as they passed would hold up their fingers to show their catch, three fish meant three fingers. It gave a skipper with no fish aboard a bit of heart, but I learned fast to keep my hands down and simply nod. Information like that was kept for one or two crews; boats who didn’t realise there were fish swimming, were inclined to go home, hence more space for us. On the Flood (incoming) tide, punts would normally gather at the Coolya Weir and in turn drift them up the Shelbourne Bank on the flood tide eventually finishing at the Power station. It was a tortuous trip, with nets getting snagged, crabs fouling the nets and currents either pulling the nets off or dragging them ashore. Old schoolers didn’t like to go below the Campile Pill, or indeed the White Stone if they could find some space. As the tides were neap (which meant weak tides) the nets were very slow to move and Paddy was delighted because it meant we would probably see out the entire flood tide from that particular “set”. He would sit watching the nets, smoking away, and pass the odd comment as he watched the other punts coming or going. I often wondered did he know what the fish were thinking as he stared at his nets, scanning along the corks, watching for the slightest movement that might suggest a fish. People often assume in their ignorance, that Salmon swim blindly into nets. Whilst that may be true on the high seas, in the rivers they are much more cautious. When fish slam into a net, it’s normally because they have panicked. Generally they swim along the nets, poking them looking for gaps, seeking a way around. Paddy had long learned to create all manner of twist and turn in an attempt to trap a fish. On this particular day, the time dragged. Paddy sat in the stern of the punt, smoking his Players Navy cut and watching the nets like a hawk. Meanwhile I was out on the shore wandering along gathering driftwood. The nets drifted sluggishly and long before high water the outside buoy started to hang back, and in time dozens of corks had floated together. Paddy decided we should head out and drag the nets off a little, so that they could catch a bit more tide. We rowed out an I bended down to catch the outside buoy. It was one of the old style metal buoys which if it struck your knee would shatter it. Most boats at the time had shiny plastic buoys which were light and bright and could be seen from a distance. Old school frowned on such modernity. Paddy started the outboard motor and instructed me to sit back and put a foot on the buoy, jamming it in the aft thwart, while the engine towed the nets off into the current. We had about half a net straightened off when it happened. I was facing astern keeping an eye on the nets, Paddy had just turned for’ad to check our position against a passing punt. It was then that I saw it. Out of the last of the fouled corks raised the tail of the biggest salmon I had ever seen, I screamed to Paddy who turned instinctively to see what I was shouting about. I knew we had to slacken off, so I jumped up releasing the pressure off the buoy, expecting Paddy to ease off on the throttle, but for once he was a bit slower than I. As I released the buoy it shot out from under my foot and catapulted off the aft thwart. It zoomed astern and as Paddy turned to face me to give instructions, the buoy brushed the ash on the fag hanging from his mouth. He turned away again in the direction of the disappearing buoy and I just thought to myself should I just jump now or wait to be thrown. However, we he turned back he had a twinkle in his eye. By slackening off when I did I’d kept the net around the salmon, and now we had a chance to land him. In old school terms, nothing was more important than landing the fish, and I’d instinctively acted to, at least try, to ensure it. Today marks one year of blogging about my community and giving a sense of just how rich this area is in terms of history, heritage and culture. A theme that runs through the writing is how the ordinary becomes a little more, once you take the time to look more closely or ask some questions. On Nationwide I mentioned how even the trees and rocks have stories to tell around here and through the weekly blog and daily facebook posts I try to illustrate that. The blog today is a case in point. It was the first I wrote, exactly one year ago today, but unlike most which now reach about 100 views per week, this made a modest 20+. Not sure that I ever paid much attention to post boxes until very recently. They are functional and I guess once you know that a letter pushed through the slot gets collected and delivered by the Postman then you are probably satisfied with that. But although we probably take them for granted a little curiosity can reveal some interesting history. Now we have a couple of post boxes in the area and they all have some history attached. Directly below is the Post Box from a wall at Cheekpoint Quay. It’s in the wall directly in front of you as you walk up from the main quay, in a wall that was once part of the home of Denis Doherty RIP and family. The curious thing is that it has the British crown on the top aside of which is marked VR. This VR cipher stands for Victoria Regina which signifies that it’s from the reign of Queen Victoria when Ireland was ruled from London. Made of cast iron, the first of these “wall box” types were erected in 1857 in the UK. Another distinguishing feature, it was manufactured by WT Allen of London – many of the Irish boxes were made under licence by Irish foundries. Haven’t been able to accurately date this one but WT Allen started manufacturing in 1887. Victoria died in 1901 so our post box in Cheekpoint is obviously in situ sometime between these dates. ﻿﻿﻿﻿There are two others locally, at Ben’s shop at the Crossroads and Faithlegg. The latter post box is a later design than the wall box in the village. It carries the gaelic print of the Dept. of Post & Telegraphs which was formed in 1924. The first Irish boxes carried an “SE” Cipher to denote Saorstat Eireann. This box probably dates from between 1937 – 40. Its builder was the Jessop Davis Foundry of Enniscorthy whose name is found near the base. This foundry operated between 1890-1964. You can find out more about the Irish postal service here. So maybe the next time you post a letter you might take a moments pause to consider the receptacle you’re using? It’s a great way for children to﻿﻿﻿﻿ learn a little history. It’s an interesting fact to swap with another consumer of the service. However, in my experience it’s probably best to keep well out of the way if Postman is coming to empty it…they do not tend to hang around!